the issuance of asset-backed tokens (also referred to as Proof-of-Asset or PoA tokens) using blockchains. These PoA tokens are digital representations of real-world assets, are thus backed by them and derive their value from them. Asset-backed tokens can, of course, be traded digitally. An asset is an economic resource (tangible or intangible) owned by somebody. The owner has the legal right to utilize it (e.g. to trade or sell it). The use of that economic resource is to produce economic value, mostly in the form of money. Examples include intellectual property, machines, land property, loans, debts, stocks, and bonds. And tokenization is an important topic. For instance, TrustToken, a tokenization platform (i.e. a platform to create asset-backed tokens), raised $20 Million in their token-presale, among others by a16z and Bankex, similar platform, raised $67 Million in their ICO. Moreover, even big corporate banks such as Commerzbank are working on blockchain-based security issuance. Read everything else Commerzbank is doing with Blockchains here! This post presents blockchain startups working on tokenization. It contains Digital Asset Managers such as the above-mentioned TrustToken who work only on tokenization but also cryptos from other industries and categories that offer tokenized assets such as real-estate investments. This post is not exhaustive, especially in regards to asset-backed cryptocurrencies. Also, the presented funding data only contains finished ICOs. Please note also that many of the projects listed below have no working product yet. 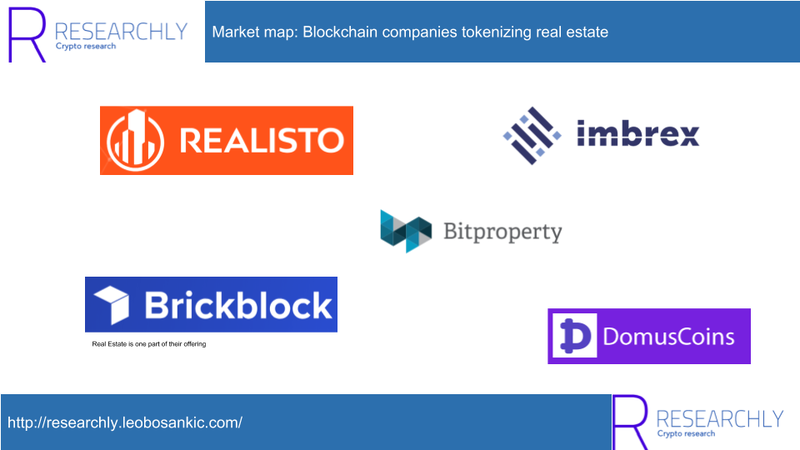 Companies in this category include Realisto, DomusCoin, and Bitproperty. They (or some third party selected by them) buy real estate property and issue so-called Proof-of-Asset (PoA) tokens that represent shares in these properties. However, none of them are yet “fully blockchain”. For instance, whereas for the most part, the tokenizing and trading happens on-chain (i.e. through smart contracts), some activities such as safeguarding fiat money takes place off-chain. Further, some middlemen such as brokers buying the assets are required and some projects have a centralization of power where the company itself determines the upgrade of new features or decides which property or brokers get listed. Nevertheless, tokenizing Real Estate still makes sense; the removal of some middlemen cuts fees and thus enables smaller investors to participate. Moreover, by circumventing current issuance infrastructure such as banks, they enable even more people – the unbanked – to invest in real estate. Also, counterparty risk is removed through quicker settlements and event-based payments (based on smart contracts), fractional ownership is possible and the digitally tradable PoA tokens make selling/buying far very efficient. Companies from that space enable the trading of utilities through blockchains. One example is tokenizing energy (i.e. electricity) as done by WePower. Using WePower, energy producers issue tokens for the financing of new energy plants. Each token represents a certain amount of energy (e.g. 1000 MWh) and can either be redeemed or traded. Commodities such as oil or gold can also be tokenized. Companies tokenizing commodities include ChainTrade (dedicated to commodities in general), DigixDAO (tokenizing gold), Orocrypt (tokenizing precious metals), or Smartlands.io for agricultural products such as cherries. Whereas “tokenizing people” might sound weird, it is what projects from this space are doing. One example is TokenStars. TokenStars, a project similar to gofundme, is building a blockchain-based platform to finance the careers of aspiring celebrities, positioning themselves as an alternative to the prevalent sports agencies. Such PoA tokens are backed by the celebrities’ status and thus derive their value from the celebrities’ fame, performance or any other relevant metric. Physical assets that have some collector’s value can be tokenized as well. For instance, art. PoA tokens from this category are backed by the artwork. The art is provided by collectors who own it. They issue PoA tokens that represent ownership of the piece. The ownership can be highly fractional and fees are lower than with traditional art investment. This allows investors of all sizes to invest and collectors get alternatives to existing art-secured financing models (who might be too expensive, have long terms etc.) One company working on blockchain-based investment in fine are is Maecenas. Finally, an example of tokenizing trading cards is Ether Legends. As a side note, both, the tokenization of art and trading cards, is the opposite of purely blockchain-based collectibles (“cryptocollectibles“) such as CryptoKitties which have no physical representation. Cryptocollectibles are one of many Cryptoeconomic Primitives and blockchain building blocks. Read more about cryptocollectibles here. Read more about Cryptoeconomic Primitives and blockchain building blocks here. Traditionally, individual investors cannot easily invest in individual movies (the prominent way is to invest indirectly by buying shares of the respective companies). Moreover, liquidity in the movie financing industry is limited as there is hardly a secondary market, friction is high and transparency low due to the number of involved stakeholders. Companies “tokenizing movies” try to solve these issues. In this context “tokenizing movies”, refers to crowdfunding the production of movies by giving individual investors fractional ownership. Among other things, this could enable a highly narrow distribution of royalties across all participants. Further, of the issued PoA tokens are used for all activities related to the production and distribution of the movie, transparency can be increased by allowing investors to exactly track the use of their investments. By the same principle TV Shows, Music or Books could be tokenized as well but one company working on movie tokenization is MovieCoin. MEDIATOKEN is a similar company but instead of movies, it is for tokenizing Instagram accounts. Further, with Apptoken, apps can be tokenized. In the case of Apptoken, the underlying asset is app revenues of the financed app. MEDIATOKEN Get money for your Instagram promotion in 3 clicks! Use blockchain technology to attract funding for your Instagram account and become famous! Of course, traditional financial assets such as equity, venture capital, debt, ETFs, or insurance products. Smartlands.io enables the tokenization of equity, ETFs can be issued with Blackmoon, Blockchain Capital‘s BCAP token represents tokenized venture capital, Dharma is a protocol for tokenizing debt, and Commerzbank has issued a loan using R3‘s Corda. Dharma The open protocol for tokenized debt. Dharma is a generic, permissionless protocol for issuing, underwriting, and administering debt instruments as cryptographic tokens. Similar to traditional financial assets, a range of cryptocurrencies exist which based their value on some other fiat or cryptocurrency. 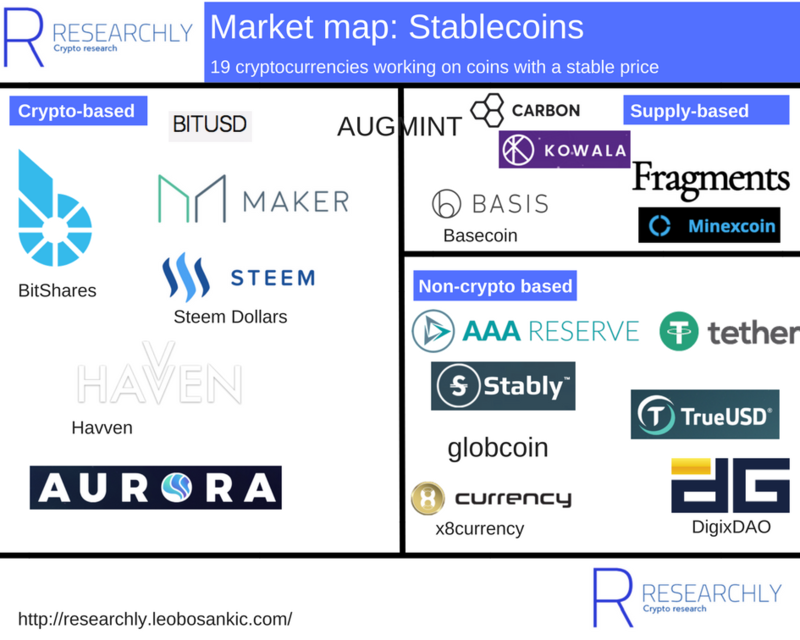 These so-called Stablecoins want to as closely pegged to their currency counterpart as possible. Read more about Stablecoins here. There are general platforms (Digital Asset Managers, Trading & investing platforms, Blockchain protocols, and similar) such as TrustToken (Digital Asset Management), Bankex (protocol) or Zen Protocol (Trading & investing platform) that enable tokenization in general. Finally, other assets that can be tokenized are Intellectual Property or vacation timeshares. Zen Protocol Zen is a decentralized financial platform, built from scratch with the goal of providing people with a secure, scalable and useful infrastructure for creating their own financial instruments, and trading them directly without intermediaries.The Zen blockchain is secured by multiple proof-of-work algorithms, with token-holder voting on the balance between them. Multi-hash mining creates robust incentives for miners to deliver efficient, reliable security. A) Prove the amount of resources a contract will consume and provide the necessary fees for running the contract to miners, removing the need for a “gas” based system. B) Prove their contracts meet a given specification, meaning they can prove the contract will definitely do (or not do) something given a specific set of parameters. The Zen platform comes with a built-in solution for oracles, which provide contracts with useful real world data.